Though most of his family hails from Hazard, Kentucky, Harley spent most of his childhood in Dayton, Ohio. Through the 70's Harley Allen sang in the family band headed by his famous father, bluegrass singer Red Allen. It was here that Harley developed his ability to set a scene and capture human nature in verse. The next 20 years Harley fronted his own groups and recorded 15 albums on various small labels. In 1996, Harley scored his first major label release on Mercury Nashville on the album ANOTHER RIVER. It brought characters and true-to-life images from Harley's world. Harley's songs have been recorded by GARTH BROOKS, ALAN JACKSON, LINDA RONSTADT, HAL KETCHUM, TY ENGLAND and ALISON KRAUSS. 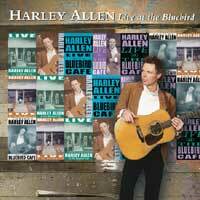 Here is HARLEY ALLEN, a great songwriter and performer, including his own versions of his hits, THE LITTLE GIRL, BETWEEN THE DEVIL & ME and EVERYTHING I LOVE IS KILLIN' ME, recorded at various performances Live At The Bluebird Café.